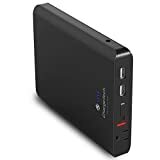 Choosing a portable battery pack seems like a easy job, but after a few hours searching for the best AC portable battery pack, the feeling of regretting is increasing inside me. That’s why I decided to create the list of best AC battery bank to help you choosing the best portable battery pack for your needs. 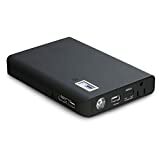 Now, lets’ take a look at the best AC portable battery pack of 2019. Why choose AC Battery Pack? What to expect from a AC Battery Pack? 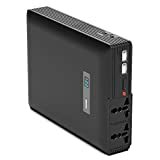 An AC Battery Pack (or AC Power Bank) is almost the same as a normal power bank, the only difference is the AC Batter Pack has one or several AC outlets to let you charge devices that require AC power source, such as laptops. A normal power bank usually has USB ports (type-A or type-C) that output DC power, and only suitable to charge small devices, like cellphones, tablets. If you need to charge laptops, large devices, an AC power bank is probably the best choice. Also, you can always use an AC battery pack as a backup power source in case of power shortage, or portable power source on your trips. You can even use an AC power bank as an UPS (Uninterruptible Power Supply), although it’s not recommended to do so, mostly because an AC power bank does not have any heat dissipation mechanism. Then look around you, see how many devices you need to charge on the go? If you have a laptop, a tablet, and a cellphone, you will need at least 20,000 mAh. Remember, the more devices you own, the more battery capacity you need. Also, you should always get largest battery capacity as possible, who know when you will run out of battery, right? First and foremost, an AC Battery Pack is designed to charge and provide electricity to large devices, such as laptops, netbooks, and even TVs. And with that reason, an AC Battery Pack comes with at least one AC outlet, but also comes with one or several USB ports to charge small devices, such as tablets, mobile phones. 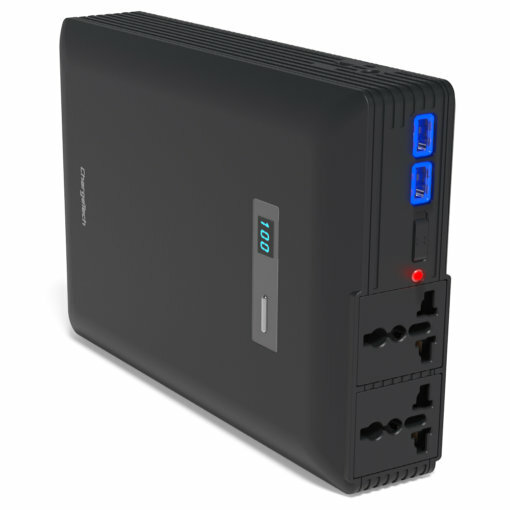 Customers will most likely choose an AC Battery Pack because the ability to charge and provide electricity to large devices, and because of that, an AC Battery Pack will have large battery capacity than a normal battery pack (or power bank). Most AC Battery Pack comes with at least 20,000 mAh battery. And of course, the size will be larger than a normal portable power bank. An AC Battery Pack will not fit in your pants’ pockets, but it will fit nicely inside your laptop bag, or tablet sling bag. Because it has larger battery, an AC Power Bank won’t be able to be charged from normal USB port, instead, it will need a dedicated power brick to charge itself. At first, we tested 8 devices, ranged from $50 to $200, then we narrowed down to the 3 most outstanding devices, which we’ll introduce later in this article. We got 3 devices, representing 3 types of device: Apple Macbook Air 2015, Apple iPad 4, Apple iPhone 6. We also consider other criteria, such as: appearance, power indicator, accessories, etc. ChargeTech is not a new name in the power bank market. They started in 2017 with their most successful product: ChargeTech – PLUG 54,000 mAh Portable Battery. The ChargeTech battery pack offers the largest battery at the moment, and you probably have already known: 54,000 mAh, which is more than enough for any daily needs. The ChargeTech PLUG Battery features a rough design with black color. On top, you can see the logo ChargeTech, a small button to check whether the device’s battery level. The power level will be displayed on a small LED screen on top. Now, everything happens on the front side of this device: 2 multi-purpose AC outlets up to 250W capacity and 110 volts, a On/Off switch, 2 quick-charge USB ports, on the right side, you’ll a dedicated charging port, and what’s more, an USB type-C charging port. Finally, a charger with USB Type-C, now I can charge my Macbook with just a small cable. The AC outlets are advertised as “The international outlets are compatible with Type A, B, C, I, G, E, and L“. This AC outlet can power any devices up to 85W, so you should check your device before plugging into the battery pack. The two USB ports can output DC 5V 2.4A with blue light indicate that the port is under use. The ChargeTech PLUG Battery is quite heavy compares to other battery pack: 4.8 pounds (or 2.1kg), so if you’re travelling light, you might want to reconsider bringing this battery pack. Please note that the ChargeTech PLUG has exceeded the maximum capacity of FAA limit to lithium batteries for safe travel at 42,000 mAh, so if you plan to travel on plane, you might want to look at alternative options down below. First, we drained all remaining power by plugging it into multiple devices, till the battery pack can no longer charge any devices. Then we plugged in the power brick to charge the battery pack. It took 8 hours and 11 minutes to fully charge the battery pack. Now, you may seem the charging time is ridiculously long, but let me explain a few bit: this is a 54,000 mAh charger, twice as much the runner up. And you should charge this battery pack overnight. After the battery pack was fully charged, we plugged in 3 devices: Apple Macbook Air 2015, Apple iPad 4, Apple iPhone 6. We continuously used all 3 devices until the battery pack went out of juice: it took 3 hour and 45 minutes to drain the battery with all 3 devices. However, the device was heated up pretty quickly, and sometimes could reach upto 80 degrees Celsius (176 degrees Fahrenheit). We then fully charged the ChargeTech PLUG battery pack, and plugged in the Apple Macbook Air with 0% battery. After 2 hours and 01 minutes, the Macbook Air was fully charged, and the ChargeTech battery pack still had 80% juice. Overall, the ChargeTech AC Battery Pack is the best all-around at the moment with the largest battery capacity, good performance, and quick to charge. It’s worth every penny. The ChargeTech – 27,000mAh Portable AC Battery Pack is an other option for portable AC Batter Pack and is the only device that has Airline and TSA approved (UL Safety Certified (E225703)). That mean you can carry the battery pack while flying, even though you can’t put it in your hand baggage. The ChargeTech Portable AC Battery features a sleek design with black color. On top, you can see the logo ChargeTech, a button to check whether the device is on or off and battery level. Next to the button is 4 LED to indicate the battery power level. There is nothing on the side, except the charging port. Take a look on the front side of this device: 1 multi-purpose AC outlet, 2 quick-charge USB ports, and a switch to turn on/off the AC outlet. The AC outlet is advertised as “Internationally compatible 110V-240V“, however, as we tested, the AC outlet can output 120v at 60Hz. This AC outlet can power any devices up to 85W, so you should check your device before plugging into the battery pack. The two USB ports can output DC 5V 2.4A with blue light indicate that the port is under use. The ChargeTech Battery Pack is quite heavy compares to other battery pack: 2.35 pounds (or 1kg), and quite big: 7.25 inches long, 5.25 inches wide and 1 inches thick. First, we drained all remaining power by plugging it into multiple devices, till the battery pack can no longer charge any devices. Then we plugged in the power brick to charge the battery pack. It took 4 hours and 15 minutes to fully charge the battery pack. After the battery pack was fully charged, we plugged in 3 devices: Apple Macbook Air 2015, Apple iPad 4, Apple iPhone 6. We continuously used all 3 devices until the battery pack went out of juice: it took 1 hour and 30 minutes to drain the battery with all 3 devices. However, the device was heated up pretty quickly, and sometimes could reach upto 75 degrees Celsius (167 degrees Fahrenheit). We then fully charged the ChargeTech battery pack, and plugged in the Apple Macbook Air with 0% battery. After 2 hours and 15 minutes, the Macbook Air was fully charged, and the ChargeTech battery pack showed 3 LED, that means the battery pack still got at least 3/4 juice. Next in our list is the NexGadget AC Battery Pack with 24,000 mAh battery capacity. Just like most battery pack,NexGadget AC Battery Pack offer a black sleek design, with a Power button and LED screen power level indicator on top. There are 2 USB ports on the left side, with a port to plug in the power brick. On the front, you will find a LED torch, another USB port, the AC switch, and a multi-purpose AC outlet. The 3 USB ports also have led light to indicate charging status. The device comes with a power brick, and a plug adapter to allow you plug in a wide range of devices. The AC outlet can output upto 110V/60Hz, and the USB ports can output upto 5V/3.1 A. The device is quite light, weighted at just 1.3 pounds (or 624 grams), and quite small: 7.3 inches long, 5.1 inches wide, and 1.2 inches thick. Again, we drained the battery pack to 0%, until the LED screen can’t power itself. Then we plugged in the power brick to charge the battery pack. It took only 1 hour and 55 minutes to fully charge the battery pack. With the device was fully charged, we plugged in 3 devices, and it took 1 hour & 10 minutes to drain all juice from the battery pack. However, after 30 minutes of continuously use, the battery pack was overheated and shutdown itself. After that, we let it cool down, and then plugged all 3 devices again. Again, with the NexGadget AC Battery Pack was fully charged, we plugged in the Apple Macbook Air at 0% battery. After 2 hours and 20 minutes, the Macbook Air was fully charged, and the LED screen showed battery at 60%. Last but not least, we have the best budget choice option: 100 PERCENT Portable Charger. Weighted at only 1.6 pounds (0.7 kg), 100 PERCENT Portable Charger the not only the most inexpensive, but also the lightest AC battery pack that we tested. And with that, 100 PERCENT Portable Charger has only battery capacity of 11,600 mAh. Like any other AC battery packs in this article, 100 PERCENT Portable Charger offer a black sleek design. Nothing on top or bottom. On the right side, you can find the power level button, along with 4 LED light indicators. On the front, you’ll find the AC outlet, a on/off LED indicator, a On/Off button, one USB 5V port, and a DC-in port for charging the battery itself. The AC outlet is somewhat weaker than other battery packs: AC output at AC120V 60Hz 65W. The USB port can output at DC5V/2.4A. We drained the battery pack to 0% until the LED indicator can’t turn on itself. Then we plug the power brick into the battery pack. It took 1 hour and 10 minutes to fully charged. With the battery pack at 100% power, because this device has only 1 USB port, so we plugged in the 2 devices (Apple Macbook Air 2015, Apple iPad 4) and continuously use those 2 devices. Surprisingly, the device didn’t heat up much, and showed good performance. After 2 hours, the battery pack ran out of juice. Remember, in this test, we only plugged in 2 devices. Again, with the battery pack fully charged, we plugged in the Apply Macbook Air at 0% battery. It took 2 hours and 20 minutes to fully charge the Macbook Air. With the rapid development of technology, we’re looking forward a much higher capacity battery, but in a smaller form, and more durable. Also, with the invasion of USB type-C port, we’re expecting more and more battery pack to have the USB type-C port. Also, PLUG – The World’s Most Powerful Battery Pack is an upcoming product, which shows a lot of promising features is raising a lot of attentions on Indiegogo: 2 AC outlets, 2 USB ports, upto 250 Watts, 48,000 mAh battery capacity, Tesla battery cells, pass-through charging, and the ability to charge with solar panel. We’re expecting some new AC Battery Pack that will come out at the end of this year, and as soon as they come out, we’ll try to get our hands on those products, test and review them. Until then, those 4 products probably will be the best Best Portable AC Battery Packs for 2020. Although AC Battery Pack is still a new concept, and more and more manufacturers are jumping into the markets. Until we have more competitors in this field, we’ll stick with our best 3 products that we mentioned above. If you think we missed any excellent product, let us know.